To kick – off the state-wide Preservation Week, Re-Invention focuses on the evolution or Re-Invention of downtown Las Vegas by comparing historic and current images of buildings such as Binion’s Hotel on Fremont Street and dramatic changes such as the re-location of the La Concha hotel lobby. Brian Alvarez, Curator of the Las Vegas News Bureau Photo & Film Archives will be there to talk about the photo collection. Additionally, Bob Stoldal, President of the Historic Preservation Commission, will kick off the weekend by talking about the Historic Preservation and Archaeological Awareness Month events scheduled. The historic images were provided courtesy of the Las Vegas News Bureau. A public reception is scheduled for Friday, May 16, from 3 to 5 p.m. in the Bridge Gallery, on the second floor of Las Vegas City Hall, located at 400 Stewart Ave. The exhibit will run through May 30, 2008. The buildings included in the collection of photographs are: Binions Horseshoe, El Cortez, Fremont Street Experience, Golden Gate Hotel, Golden Nugget, Hotel Sal Sagev, La Concha, Las Vegas Club, Las Vegas Grammar School (Fifth Street School), Las Vegas Post Office, the Morelli House, Union Pacific Railroad Station, and the Union Plaza. 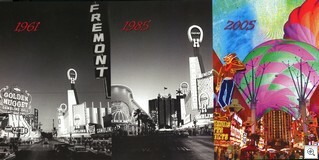 Included will be several aerial and over-all photos of Fremont Street. Visitors may reach the gallery through the second floor of the Las Vegas City Hall parking garage on the southeast corner of Stewart Avenue and Fourth Street. Parking is by paid meter only. Hours are Monday through Friday, 8 a.m. to 5 p.m., excluding holidays. There is no charge for admission. For more information about the Bridge Gallery call (702)-229-1012. Originally envisioned as a publicity-generating tool by the Las Vegas Chamber of Commerce the Desert Sea News Bureau, now known as the Las Vegas News Bureau, was created in 1949. Today, the Las Vegas News Bureau is an integral part of the Las Vegas Convention and Visitors Authority. For almost 60 years, the Las Vegas News Bureau has captured the sights and sounds of the world’s leading destination like no one else, and has played a unique role in marketing Las Vegas by documenting unforgettable images on film.